The game of the day Wednesday at the CIF Southern Section Finals at the Anaheim Arena was a defensive masterpiece, taking two overtime periods to finally decide. In fact, you could say that Laguna Hills had to win it twice. The Lady Hawks overcame the confusion that ensued at the end of regulation to hold off Alemany in double OT for a 59-55 win and the CIF-SS Division 3AA championship. It is the fifth division title, the last one coming in 2008. With Laguna Hills leading 45-43 as time ran out in the fourth quarter, Alemany’s Hannah Johnson tipped in a missed shot by teammate Alex Moon, but nearly everyone in the arena thought time had expired. As the referees conferred over the matter, Laguna Hills senior guard Brooke Shimazaki, who had come up with the ball after the shot, stood puzzled as her team celebrated. 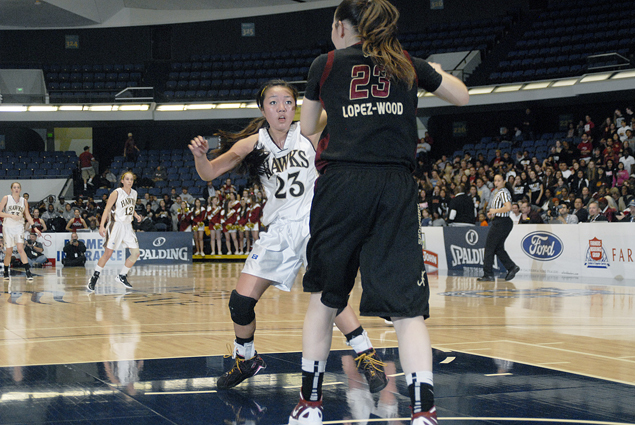 Shimazaki guards Leslie Lopez-Wood, who led Alemany with 23 points. The senior guard said her team was more than a little nervous in the overtime periods, but they were able to stay focused on the skills and composure that got them to into the final. 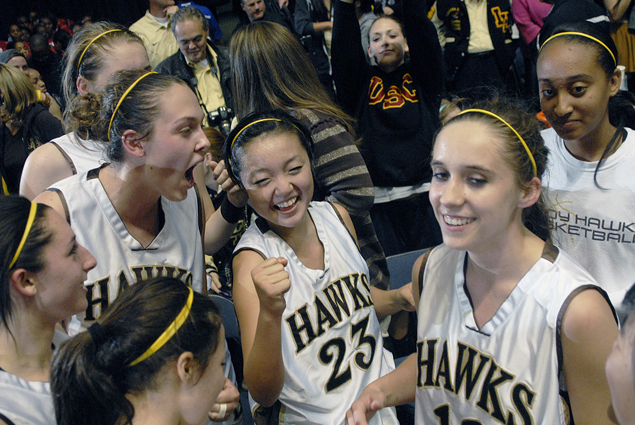 After what Laguna Hills head coach Jim Martin called “one of the craziest games I’ve ever been involved in,” the Lady Hawks were expecting a short rest before they begin the State Tournament. Laguna Hills is expected to open up Southern California regional play Wednesday at home. Pairings for the tournament are expected Monday. By reaching the final game, Alemany also earned a State berth. Shimazaki, 17, ended the night with only three points, but said this is a memory of a lifetime. 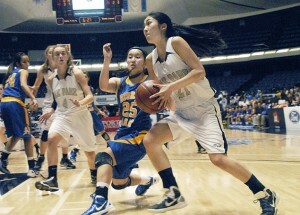 Oak Park's Erin Matsumoto beats Michelle Yamamoto of Bishop Amat in the fourth quarter of the Div. 3A championship game. “I’ll never forget this day,” she said. Earlier, Oak Park’s Eagles mounted a gutsy fourth-quarter comeback, but couldn’t rebound from a 23-point deficit after three periods, and fell to the Bishop Amat Lancers, 44-30, in the Div. 3A title game. The Lancers proved themselves again as a hard-scrabble group, jumping out to an early lead against a taller, stronger Oak Park squad en route to its first CIF title since 2006 and fifth since 1999. Senior co-captain Michelle Yamamoto scored three points with two assists for the champions, who will also open the SoCal regionals on Wednesday.